Learn to make fabulous bracelets from old neckties at my hands-on (pun intended) free workshop at the Pinole Artisan’s August 4, 2017 general meeting! I’ll provide materials and tools – but if you have a tie that you KNOW (check with the tie-wearer first!) won’t ever be worn again, bring it along. Also – any fun buttons you’d like to sew onto your bracelet …. Pinole Artisans meet the first Friday of every month at the Pinole United Methodist Church, 2000 San Pablo Avenue. Wheelchair accessible. Meetings begin at 7 p.m., are free, with very friendly artists and snacks. All are welcome! Exciting news for the Friday June 3rd Pinole Artisan meeting! Encaustic artist Raven Iacono will give a presentation introducing us to this fascinating medium, also known as hot wax painting. Raven’s presentation will cover “The Basics, Surfaces, Safety, Advanced Techniques, Mixed Media, Video Tips and Technical Information.” She will also have handouts and answer questions at the end of the presentation. Encaustic is a wax-based paint composed of beeswax, resin and pigment, which is heated, applied to an absorbent surface and then fused by reheating. Visit the Pinole Artisan website to learn more about this wonderful group. Come and create at the Pinole Artisan’s March 4, 2016 general meeting! Mixed media artist Grace Taormina will lead a hand’s-on workshop exploring combining artistic media to create original designs for a variety of surfaces. Grace will show you new ways to create pattern and textural interest with heat embossing, stencils and stamps. All materials will be provided. The author of two books about rubber stamping, Grace is a designer and a mixed media and fiber artist who teaches a wide variety of art classes in the Bay Area, nationally, and online at CraftArtEdu.com. Pinole Artisan general meetings are held the first Friday of every month at the Pinole United Methodist Church, 2000 San Pablo Avenue. Meetings begin at 7 p.m., are free, with very friendly artists and snacks. All are welcome! Leave a comment Posted in Art events Tagged "grace taormina", "hands-on workshop", "Pinole Artisans"
Watercolor artist and teacher Michael Reardon will be the guest speaker/demonstrator at the Friday February 5, 2016 Pinole Artisan general meeting. Reardon has been painting in watercolor for over twenty-five years. In his artist statement, he explains that he uses the medium to record his observations, convey a sense of place and light, and communicate his impressions of the built, natural, and imagined worlds. Reardon exhibits his watercolors nationally and internationally. Recently his paintings won two awards at the San Diego Watercolor Society International Exhibition. In 2011 he presented a solo show at the Thomas Reynolds Gallery in San Francisco, and in 2012 he won Best of Show at the Triton Museum of Art Statewide Exhibition of Watercolor. Very much in demand as an instructor, Reardon leads workshops around the country and internationally, in which he focuses on teaching the use of light and color. His watercolors have been featured in many magazines, including American Artist Watercolor, the Artist’s Magazine, Southwest Art, Watercolor Artist, Plein Air. And L’Art de l’Aquarelle. He is also the author of the forthcoming book “Watercolor Techniques: Painting Light and Color in Landscapes and Cityscapes” to be published by North Light Books in February 2016. Click here to learn more about Micheal Reardon. Pinole Artisan meetings are held on the first Friday of every month at the Pinole United Methodist Church, 2000 San Pablo Avenue. Meetings begin at 7 p.m., are free, with very friendly artists and snacks. All are welcome! The multi-talented artist Linda Russio will be the guest speaker at the Friday August 7, 2015 Pinole Artisan general meeting. Linda, whose business is called Stop n’ Paws, makes unique handmade jewelry and accessories including personalized pendants, and apparel for dogs such as coats, harnesses and bandannas. Linda’s exciting and diverse line of jewelry is inspired by animals and nature, and she creates a lot of her jewelry by re-using game pieces and other vintage finds. At the August meeting, Linda will demonstrate and give us tips and tricks on using epoxy resin to make tile coasters and small jewelry pieces. Linda created this optical lens necklace — the frame around the cats is three dimensional and the frame and image are coated with resin. You can see Linda’s work at her website, Stop ‘n Paws and in her Etsy store. Some of her pet apparel is also available at the All Hounds Pet Store in Crockett, California, and she shows at local fairs. You can get updates by following her on Facebook. Leave a comment Posted in Art events Tagged "Linda Russio", "Pinole Artisans"
Painter Larry Hatfield will be the guest speaker at the Friday July 3, 2015 Pinole Artisan general meeting. Larry has been a graphic designer and Illustrator, and has also done etching, 3D animation and computer graphics. He is currently concentrating on his drawing and painting. Larry will show and discuss his paintings, and will do a demonstration. You can see some of Larry’s artwork at his website. Leave a comment Posted in Art events Tagged "Larry Hatfield", "Pinole Artisans"
Anne Austin, the Curator and Coordinator of the City of San Pablo Art Gallery, will be the guest speaker at the June 5, 2015 Pinole Artisan general meeting. San Pablo Art Gallery, photo by Marvin Soriano. 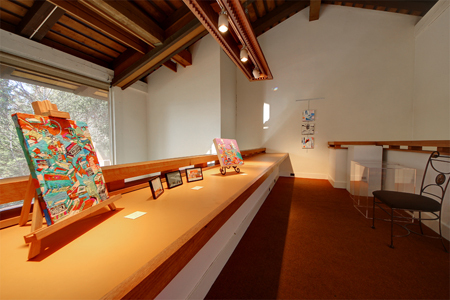 The San Pablo Art Gallery features monthly shows of local artists and group exhibitions. Several Pinole Artisans have had shows at the Gallery. Anne will speak about curating and coordinating exhibits, and about showing artwork in general. She will also discuss what she looks for when she selects artists for shows, how she finds new artists, and what she sees as trends in the art world from a gallerist’s perspective. Anne will show photos of the Gallery, and will also show her own artwork. You can see some of Anne’s artwork at her website. Leave a comment Posted in Art events Tagged "Anne Austin", "Pinole Artisans", "San Pablo Art Gallery"